After the informative workshop held by the committee on crypto currencies, digitalisation and the European Semester, next 21 June 2018, in the morning, the committee will host a hearing entitled "Lesson learnt from the Paradise Papers". The hearing will be structured in two panels. 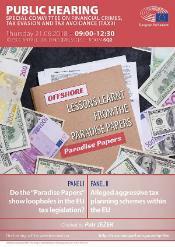 The first of which will be devoted to analysing whether the "Paradise Papers" show loopholes in the EU tax legislation and whether further action needs to be taken. A representative from the OECD, a journalist from the ICIJ consortium and an academic have been invited to share their views with the committee. The second panel will consist of a hearing with multinational corporations on alleged aggressive tax planning schemes within the EU. Two multinationals, McDonald's and Nike, have already confirmed their participation. Patricia Johnson, Vice-President and Chief Tax Officer, Nike Inc.